Here’s a trick I invented to sum only the even numbers in a range. Let’s take, for example, the range F3:F21, in which there are both odd and even numbers (see attached picture). 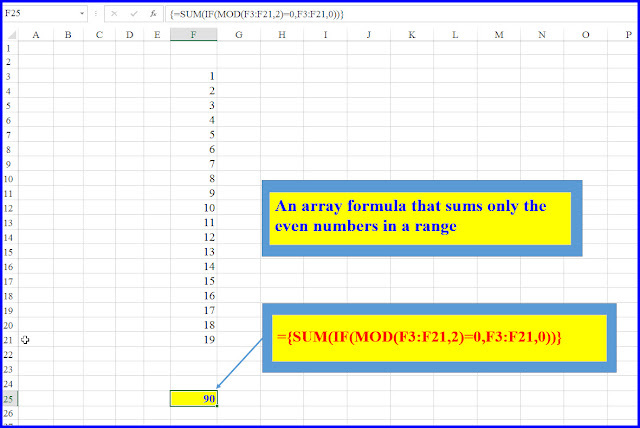 The MOD function in Excel calculates the remainder of an arithmetic division. There are two arguments to this Function: the first is the number(s) we want to divide [the dividend], and the second is the divisor. For example: MOD(1,2), i.e. dividing 1 by 2, will return a remainder of 1. Our array formula checks each and every number in the range after division by 2, which means: it checks whether the dividend is even. The IF function “wraps” the MOD function and checks the condition (for each number in the array): if it is even, it takes the number itself, otherwise – it replaces it by a zero. 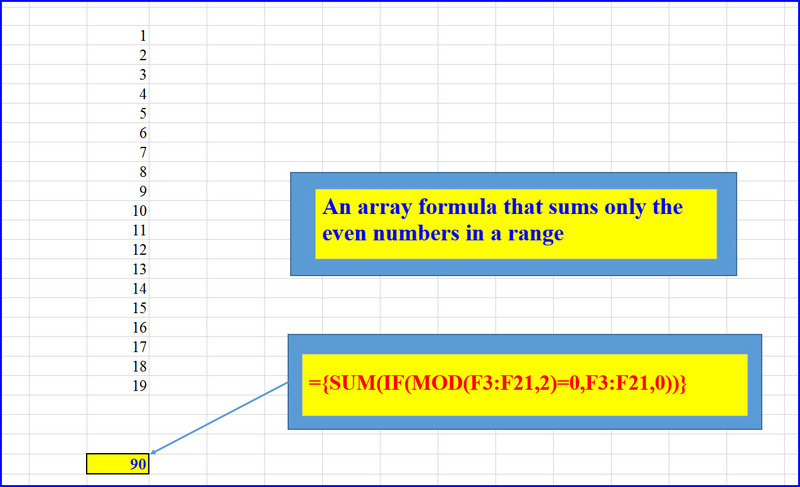 Finally, the SUM function “wraps” the previous functions and sums the whole array: since the IF “changed” all original odd numbers into zero, then we get as a result the summation of the even numbers only. Since this is an Array Formula: After typing it do not press ENTER, but CTRL+SHIFT+ENTER, instead. Excel then adds the curly braces to indicate that this is an array formula: a formula operating on an array/range of cells, as opposed to a regular formula which operates on a single cell.